Greek Yogurt Cucumbers are an easy to prepare, cool and fresh side dish featuring crisp cucumbers and creamy greek yogurt. My summer garden always starts out so fabulous. Everything is green and lush and just beautiful. It's so full of life, you know? There's nothing like harvesting vegetables and bringing them straight to the kitchen for preparation. It's doesn't get fresher than that! But sadly, the cucumber crop didn't last long this year. I grow everything organically, which means no pesticides for me. That also means more bugs. Lots and lots more bugs. Bugs that just so happen to love to munch on all of my precious veggies. Boo. I'm working on it though. I'm looking into organic pest control options and next year I'm going to be ready for those little veggie-munching buggers. They'd better watch out 'cause I'm coming for them. I did have a few weeks, though, where everything was growing smashingly. I harvested plenty of cucumbers and enjoyed them in my garden salads, in my Tomato, Cucumber and Onion Salad with Feta, in my Greek Shrimp Panzanella Bread Salad, and in this recipe. 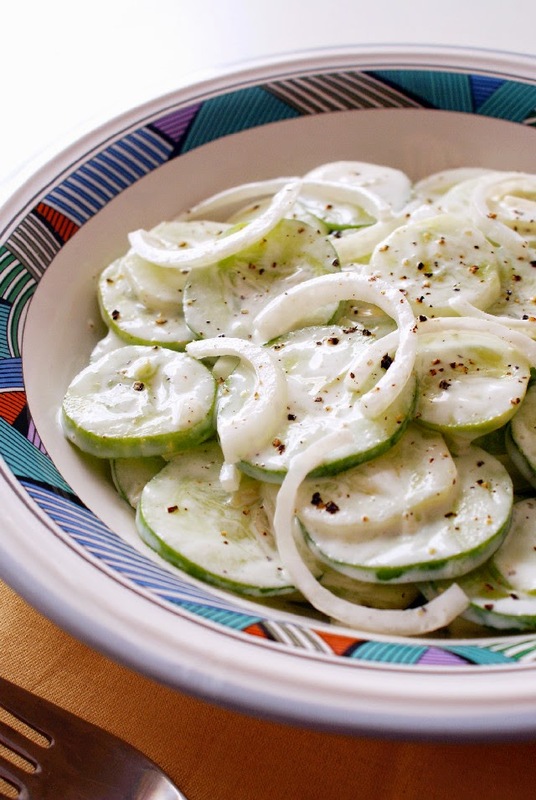 This is a great way to turn your cucs into a side dish by simply adding some sweet onions and dressing them in a cool greek yogurt mixture. Super easy and perfect for your garden's bounty! In a large bowl, whisk together the greek yogurt, vinegar, sugar and black pepper. Add the cucumbers and onions to the greek yogurt mixture and toss to coat. Cover and refrigerate for at least 2 hours before serving. You can peel the cucumbers or leave the peel on, whichever is your preference. I like lots of black pepper to add a little zip to the sweet greek yogurt mixture, but usually have to scale it back a little for the kiddos. Season with the black pepper at your discretion. Source: Adapted from Sour Cream Cucumbers from Taste of Home magazine. Yum. Will definitely be trying this recipe! OK, I'll have to substitute non-calorie sweetener for the sugar (or skip that altogether) but otherwise this fits with my low-carb diet very very well! THANKS!!! Sound very healthy and refreshing. Surely going to try. Going to substitute rice wine vinegar instead of white wine vinegar and sugar. Still vinegarery and sweet. Making this tomorrow! !